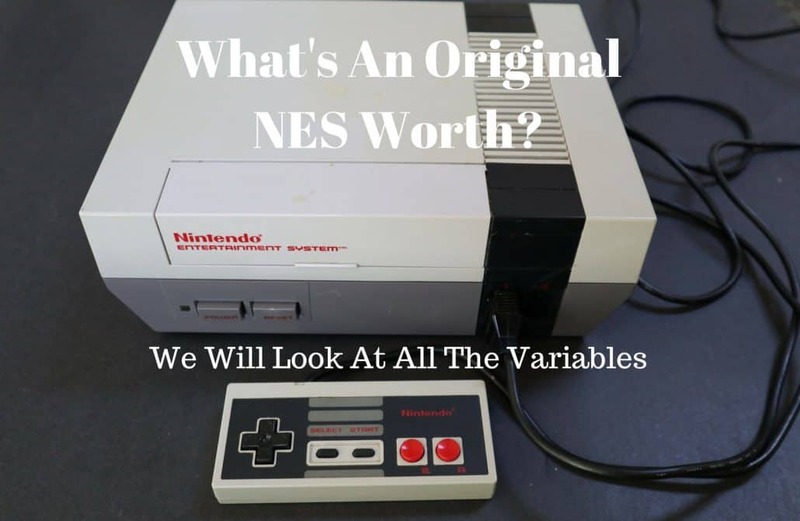 So What Is An Original NES Worth These Days? Is It Just A System With No Box Or Games? 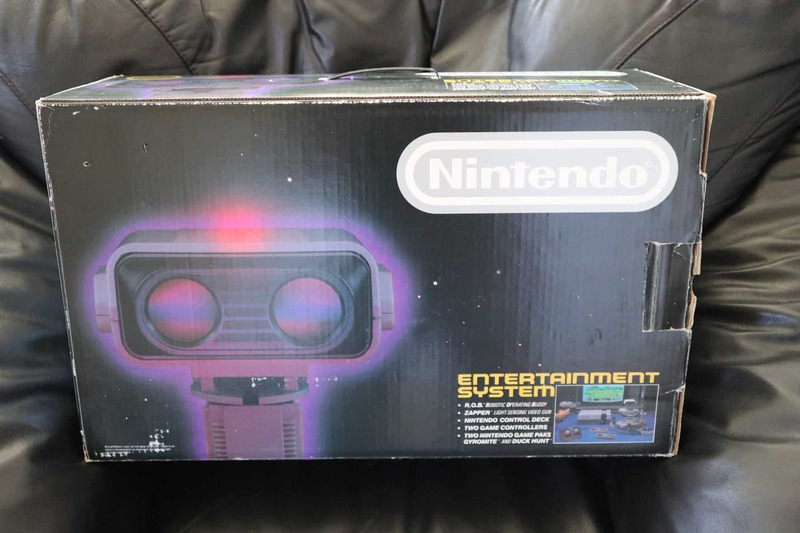 Ok, What Is An Original Nintendo In Box Value Matt? 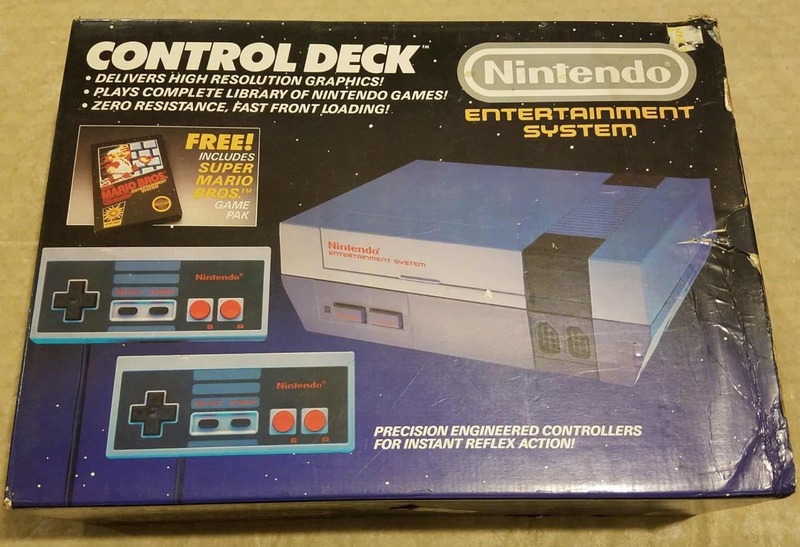 1985: Original NES Control Deck With Super Mario Bros.
Oh the age old question. For all of those that watched storage wars years ago, it really added a headache as everyone thought they were worth a million dollars all of a sudden! Thanks fake reality TV. No, it is not worth a million dollars, but there are some variations that if in the right condition could be worth tens of thousands of dollars to the right collector. To figure out a better gauged price range, let’s take a look at some of the variables we need to consider first. 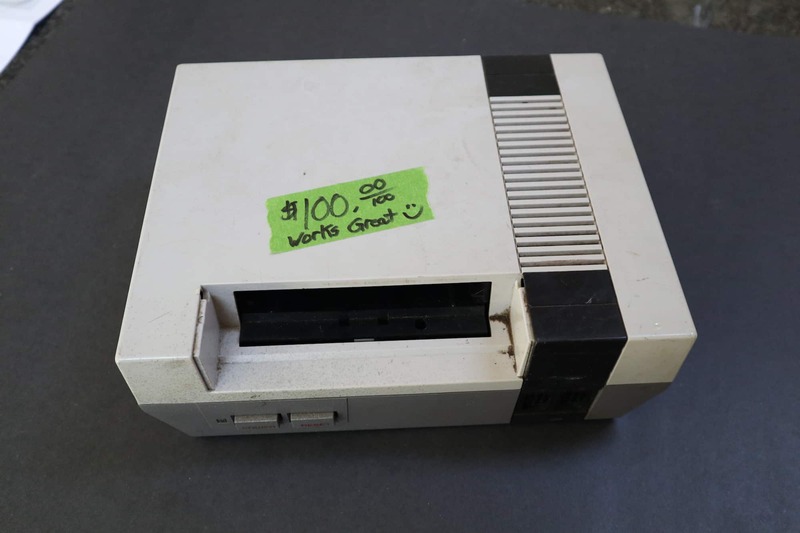 Your typical NES system you will find on ebay, amazon, or a flee market will typically come with a console, a controller or two, a power pack, and a game switch. These used to sell for about $45-$55 but they may have gone up a bit. If you can find the standard working setup for $30-$40, you have a good deal. Normally this will be at a garage sale or rummage sale at this price. 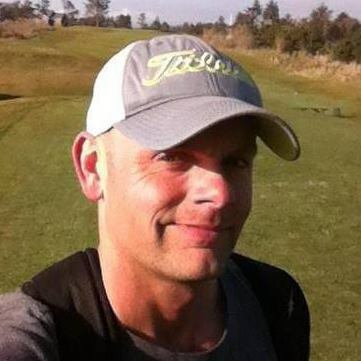 Sometimes you will run into the following…. Outside of early Famicom releases, this is the very first release Nintendo Entertainment System in the USA. This was the New York Test Release and then there was the full blown second release NES Deluxe Set soon after that I will post below. This System complete (meaning everything is inside that is supposed to be there) Can go for anywhere from $300 on up. This complete systems can vary all over the map in price difference just due to condition alone. I’d be more likely to buy a nice condition system vs a banged up system even if it is complete. Always feel free to email me or contact me if you have further questions or maybe you have a system or games that you would like to sell as I am always a buyer and then you don’t have to pay Ebay fees. You can also check out my other blog on buying video games for cash. 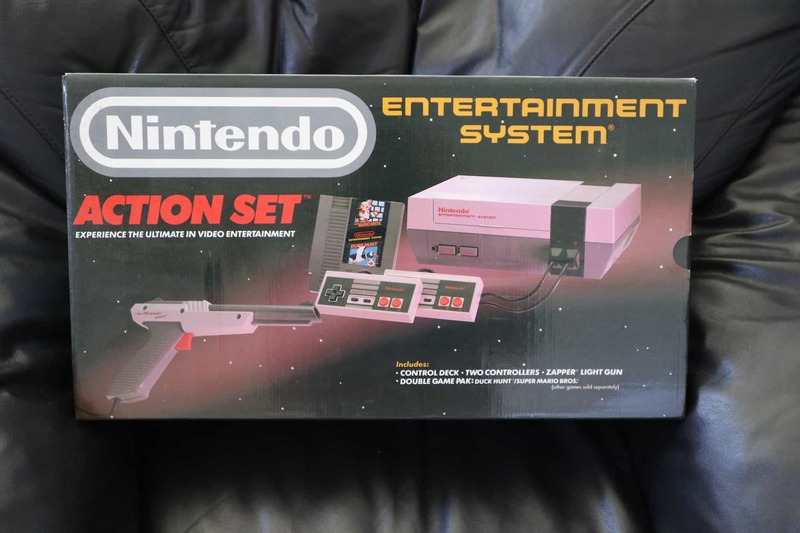 This was really the first Nintendo Entertainment System set that hit the map full force and often referred to as the original release because it was the first in full production and what most people were exposed to. 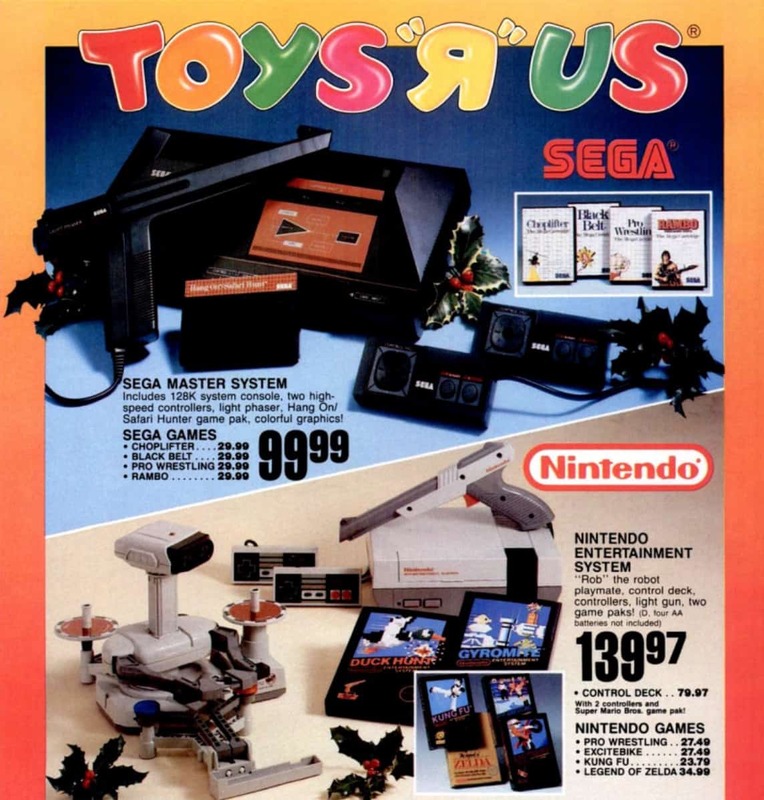 I remember seeing this in the Sears catalog as a kid and wishing I had $199.00 (first early model prices). My good friend down the road had one but his dad wouldn’t let us play it without supervision, so we basically never played it…lol. The value of this is not much different from the first. I have seen these start complete for $250 and go up from there. Normally between $250-$450 on Ebay. At a game show with cash $250 talks 🙂 Not having to pay Ebay fees makes a difference to us all. Again, the difference in price here is going to be based mainly on condition. Mint or perfect will always fetch a higher dollar figure and it if is banged up or trash, not as much as you might think. Most of the time with any NES Delux set, you run into missing pieces as there were a lot especially when it came to the R.O.B. parts that are in the box. Now this is a prime example of something that looks complete right? It would appear that everything is there and complete, but when you are a true collector, you will know that it is not complete. All the parts are there so you can see and reference them, but it is actually missing all the original baggies and ties that went around each and every piece. Even in this picture the system is not complete as it is missing the games as you can see in the top left corner where one controller is stuffed into. Needless to say, it is very difficult to get a “truly complete” system. When you can find one, they will fetch a better value. Anyone is free to ask what they want, but if you want a real buyer, these are the factors a real buyer will be looking at. One of the greatest and most sold control decks in history. This is what I got for Christmas as a kid. It was still fairly expensive as it was typically found around $89.00 at just about any store with an electronics department. We would always look it up in J.C. Penny Catalogs or at Toys “R” Us. When I got mine, I literally had a line of kids out the door wanting to come in and play it. It was nuts and life-changing. The graphics alone were so much better than it’s predecessor (Atari). This was the first time you could have arcade graphics in your own home. You can find these systems used and complete all day on eBay. If you are patient you could probably get one for $100 complete with box. If you are after a mint one, you will pay $180 or more. For just the system and maybe Super Mario and no box, you can get one for anywhere from $35-$55. more than that is probably too much unless it is perfect with really nice controllers. 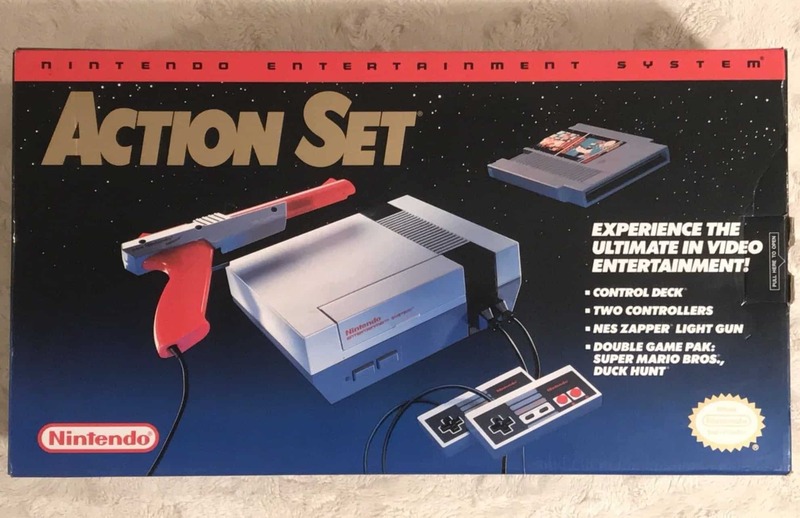 The combo of Super Mario and Duckhunt is probably the most seen cartridge on the planet which is what leads me to believe that this could be the most sold system ever (include later releases of this same system in 1992). 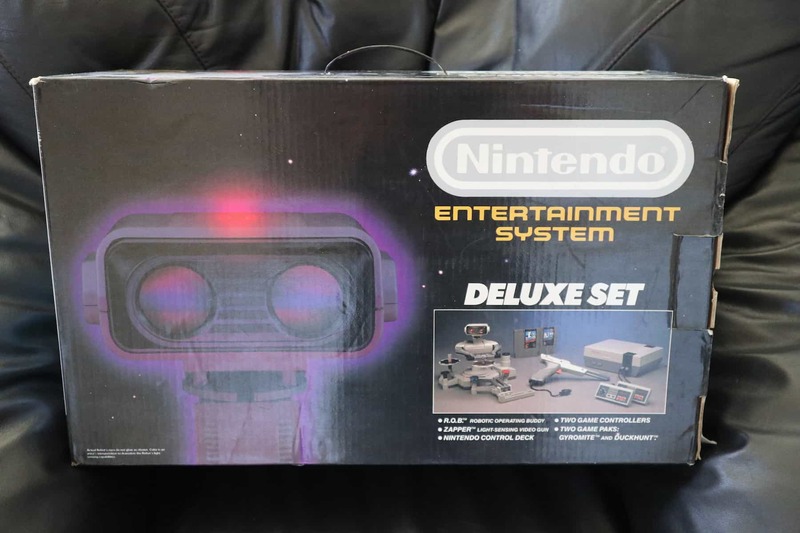 This is the most complete system as very few people ever played R.O.B. so why even pay the extra and have it?! These action sets were about $115.00 new and easily available. 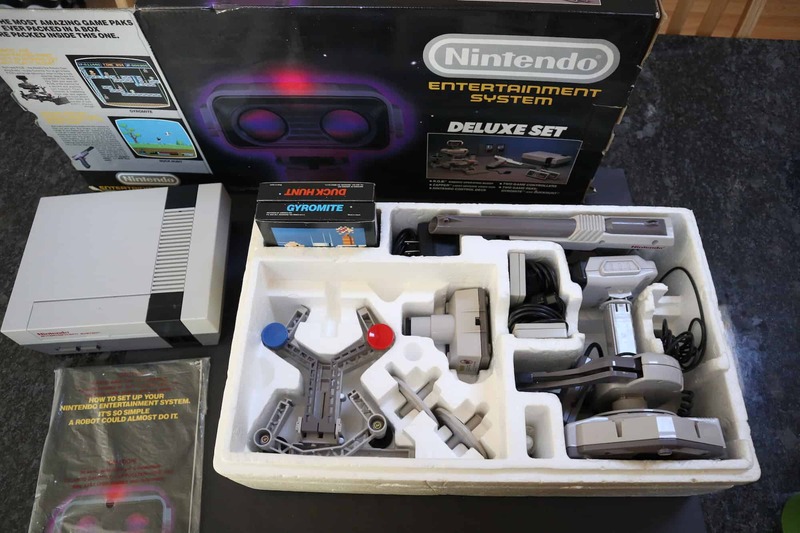 One reason these sold a lot was that at this point, Nintendo’s game line was expanding fast and there were soooo many game options to play and buy. When you went to go get a system, this is pretty much what they had on hand. People just wanted the extra gun for a little more money (and people actually used it). You can find these on eBay any time you want for $100 on up if it has the box and is complete. If it is just the basic system, game, gun, but no box, you can get it for $55-$75. As you can see, mine is a little beat up, but hey, I still love it . When this came out in 1988 it was revolutionary. I know that today they have all kinds of great dance pads and other things, but this was breaking ground and the first of it’s kind. I only knew one person who had it and we had to “be careful” when playing with it apparently. I suppose back then it was a decent amount of money. It was so crazy that you could play a game by fake running on a pad. It was fun too. If you get one of these, you should really try it. 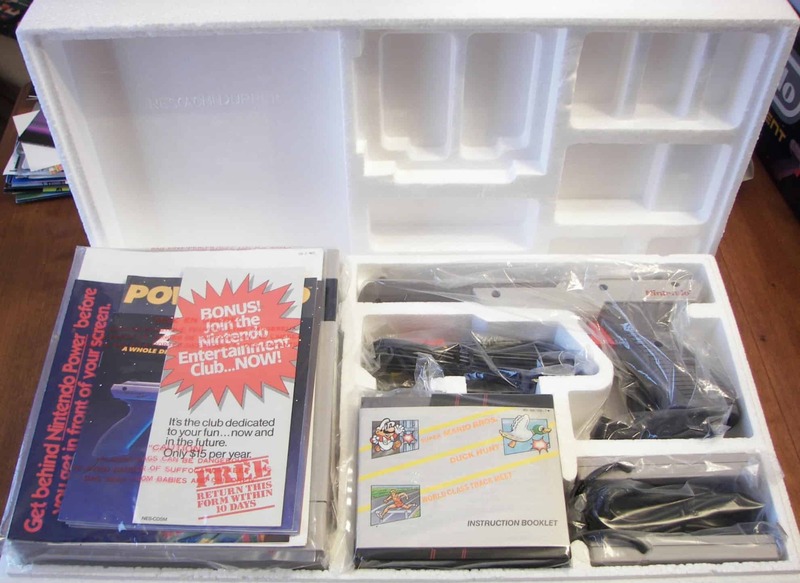 This set was a bigger box and came with the power pad boxed on top of the usual power set system. 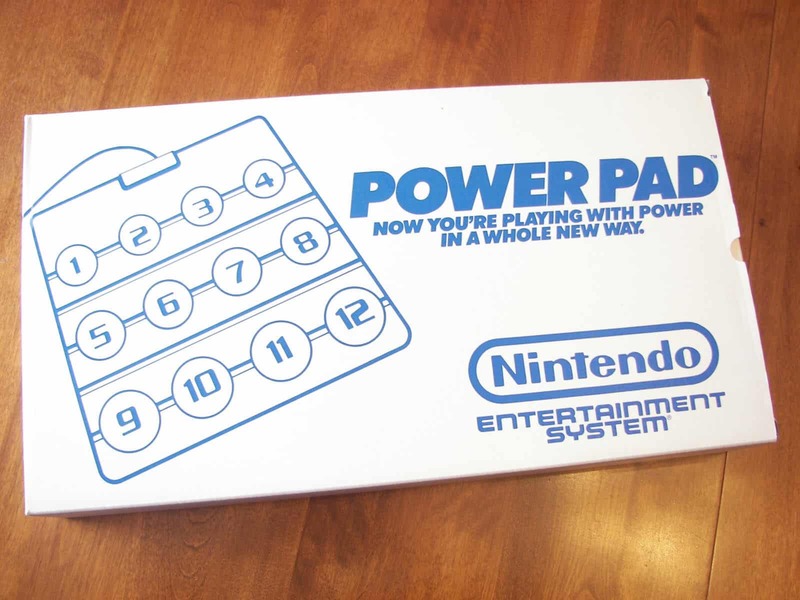 As you can see outside of the power pad the only difference between this and the power set is the Super Mario/ Duck Hunt/ Track And Field game that is included with it. This picture is a very nice complete system that would fetch top dollar for this set. You can find these Complete with box anywhere from $100-$220 on average. There are a lot of possible missing parts and such that change the overall value. 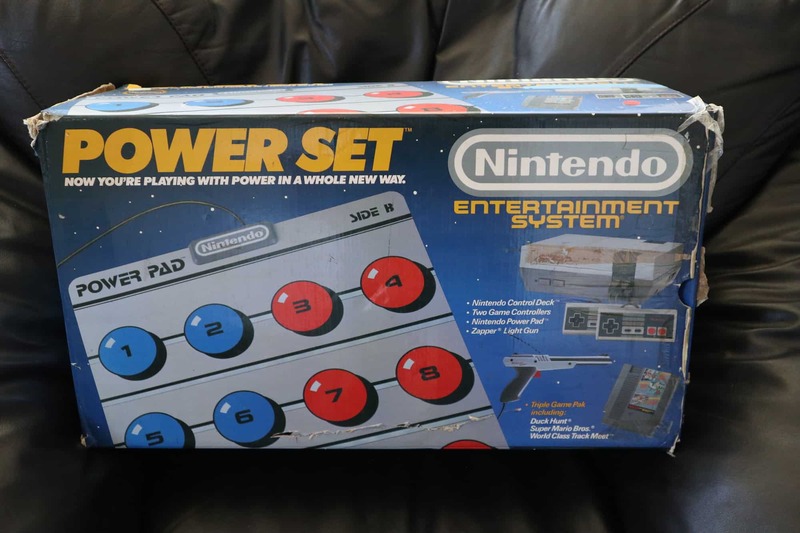 Typically you won’t find a set with the power pad box still with it. Either way, this is a common set and easy to find any time on ebay. One of these without a box and just the components would be around $70.00 on average. This is real simple honestly. This was a very basic bare bones system that came out in 1990 that just had the system, all the hook ups and 2 controllers. That is it! No games, zapper, power pad, R.O.B., or anything. I think you could get these new for around $80. People got these at the time because any video store in your home town rented Nintendo games, so you didn’t need to go out and spend $35-$65 dollars on a new game that maybe you knew nothing about. You could just go rent games! I had over 1,000 rentals at my local video store …they told me, thats how I know. You can find this system complete for $100-$150 on average. Without the box it would just be the usual $35-$55 on average. Nothing special at all here. I’m not going to spend a whole lot of time talking about the updated action set. Basically it is just an updated box for 1990 for the original in 1988. There isn’t anything drastically different about it other than it only had the orangeish red zapper and not the grey one. 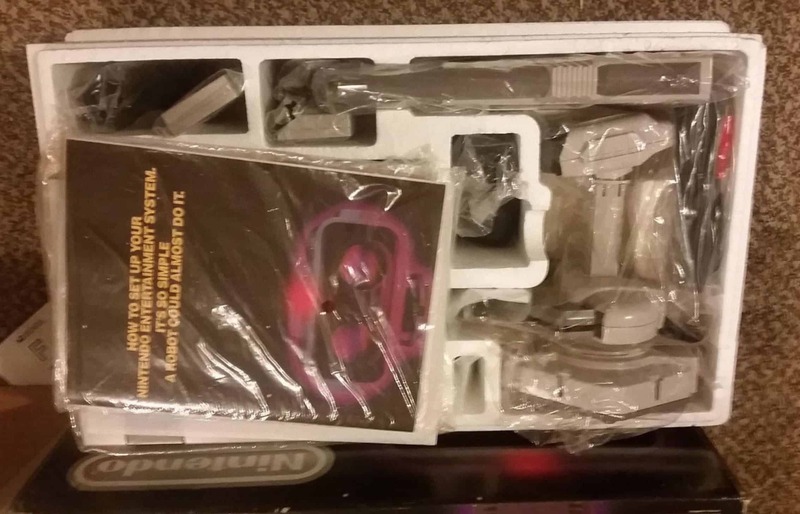 The price for this is really no different than the action power, basically $100 on up complete and $55-$75 dollars for all the stuff without a box. I really just wanted to show the different later release version for those who may not have known. 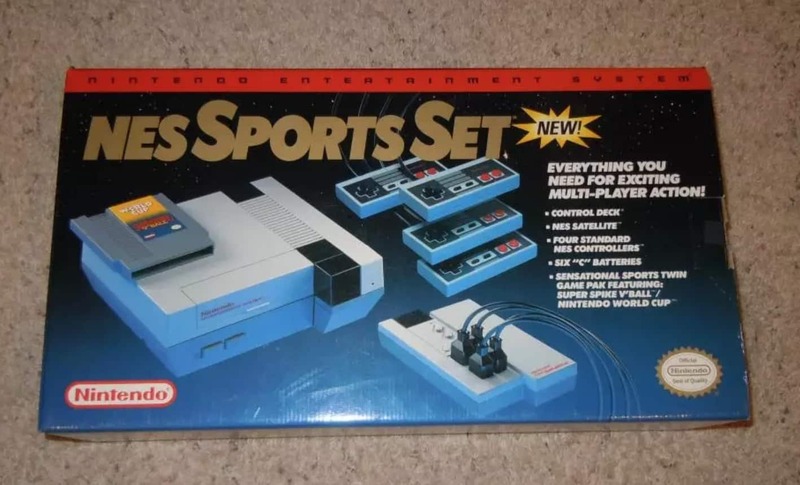 Not many people know that this 1990 NES sports set even existed. 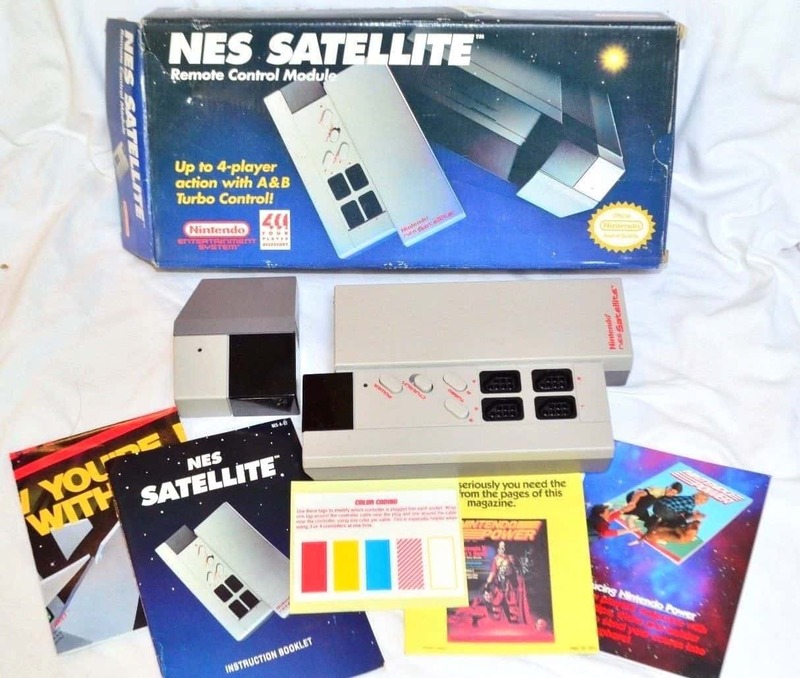 In 1990 Nintendo had a few 4 player games that came out where you could go out and buy the NES satellite so you could play with 4 friends which was a crazy idea and a very new concept. You have to stop and realize that we were playing games at this time on very small 22″ or less TV’s, so trying to see 4 people at the same time was very hard. Back then a big screen TV was 40″ and that was huge! It was a very different time. Also, 4 players was unheard of. We didn’t have Xbox’s with 4 controller inputs. It was ground breaking really. Nintendo was really ahead of the game in many departments. Now with all that said, the 4 player games weren’t that great and typically they were bad sports games. I mean , look at the games that came with this system, World Cup Soccer and Super Spike V-Ball. Nintendo did eventually came out with 23 different games that you could play more than 2 players on. You can read about it on Wikipedia here. As you can see this came with a lot. You got 4 controllers, a NES satellite, game cartridge, system and hookups. No Zapper, super Mario or anything like that. You can find these complete on eBay from $100-$200 or so depending on completeness and condition. Most of these are missing things and the satellite typically yellowed a little. Nintendo must have cheapened there materials in later years because you started to see a lot of yellowing systems, controllers, and such. I can’t say that any of the early systems yellowed much at all. This system without the box you could find for around $60-$80 in my opinion. 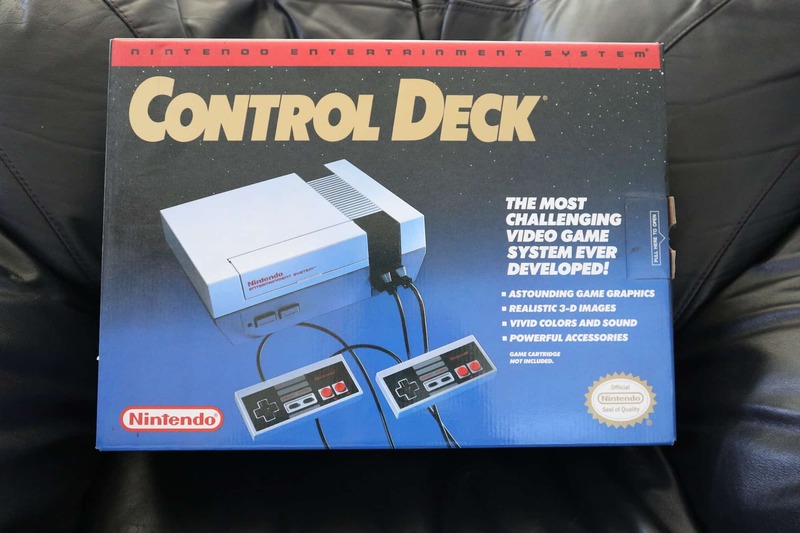 In 1992, Nintendo upgraded their basic control deck by adding Super Mario 3 (one on Nintendo’s hottest selling and most successful games ever) and called in their NES challenge set. Oh it really hurts me to watch that. Basically it went from being worth $1,000 to $200 in 1 minute…lol. This is why I am writing this blog to really express the difference in values and why. If you see something go for a crazy high amount, it is likely because it was dead mint or never opened. 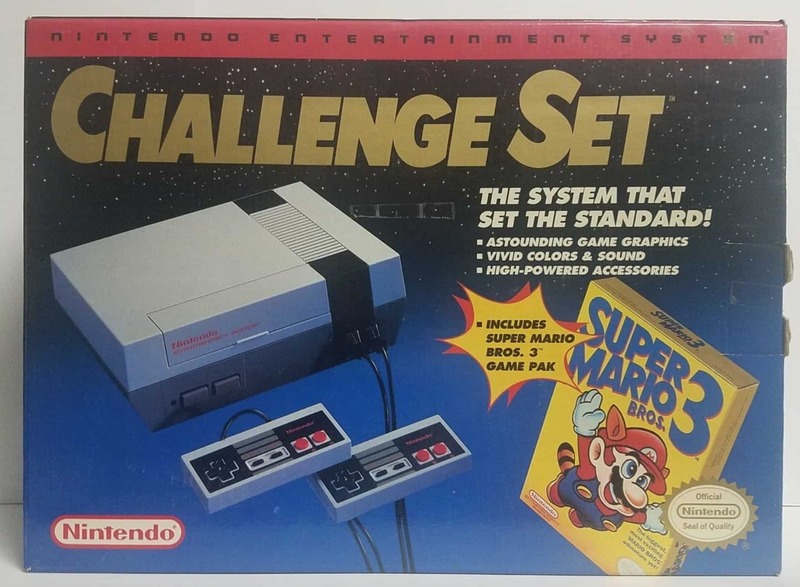 You can find these challenge sets complete on ebay for anywhere from $100-$200 or more if it still has a sealed Mario 3 inside. 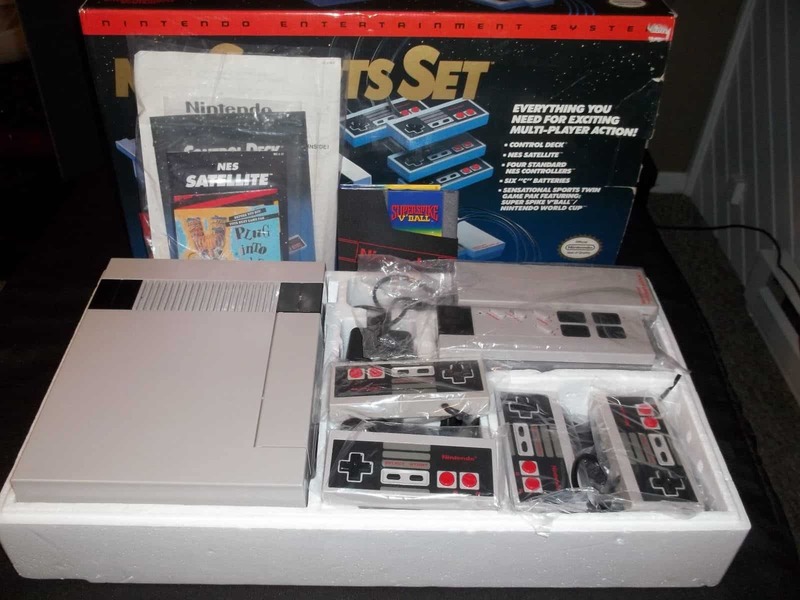 This system used and without the box is worth about $50-$70 just because it has SMB3 with it. The last one on our list and one of my favorites! 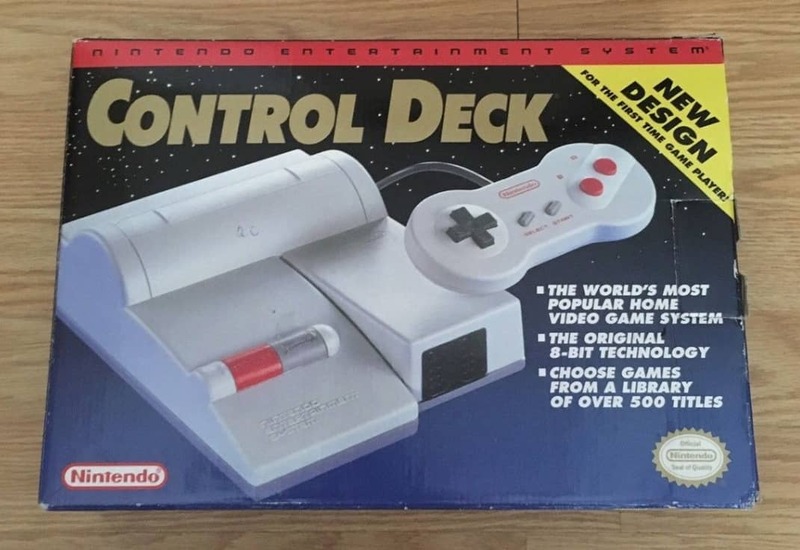 In 1993 Nintendo came out with a new control deck design and all of us enthusiasts called it the “top loader” and you can see why. The corrosion and worn out 72 pin connectors in the old “toaster box” systems as pictured on the right. 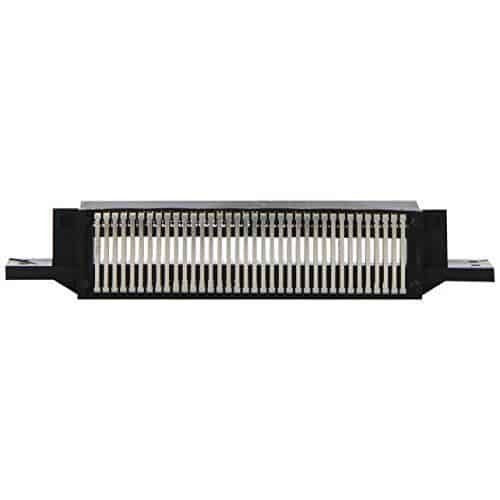 Everyone was used to blowing on games and putting them in the system multiple times, sometimes even wedging things above the game in the system to put pressure down giving it a more positive connection on the worn out 72 pin connectors. 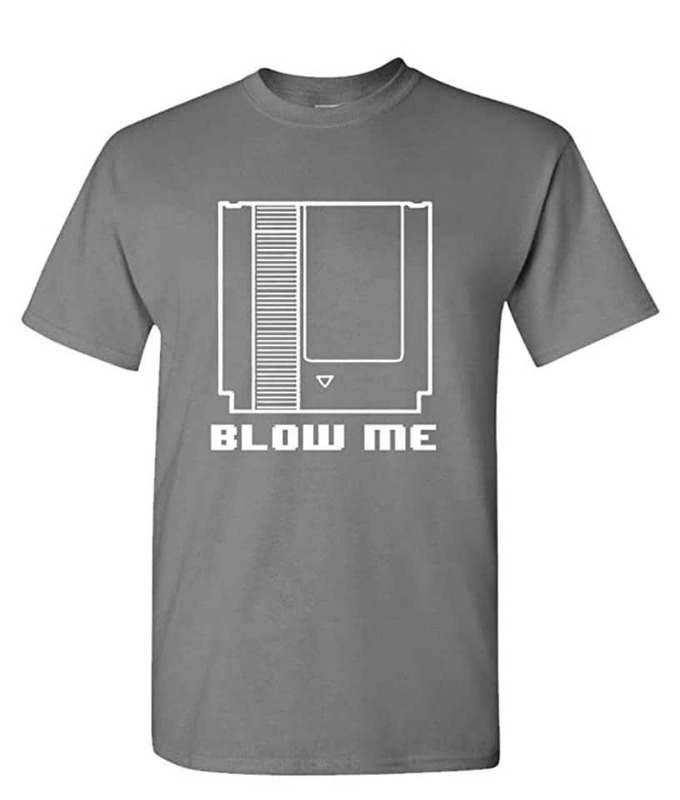 They even have shirts today that joke about blowing on NES games...lol. As you can see this was a very basic system. 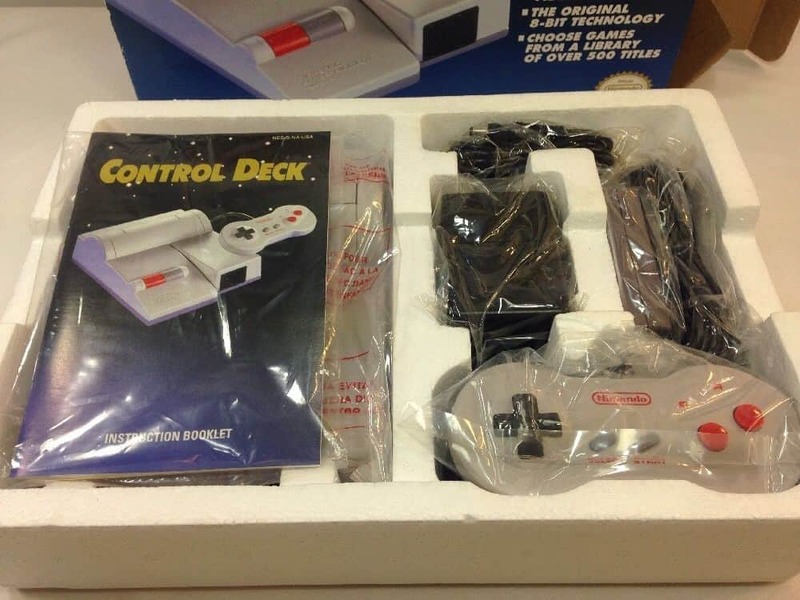 In fact, it only came with the system, hook ups, and one controller that was a new style that we call a “dog bone” controller for obvious reasons. This was kind of lame, because it forced someone to go out and buy another controller if you wanted to play a 2 player game. The price for this complete will run you anywhere from $100-$250 or more depending on condition. It is a little more sought after as it was one of the better systems in my opinion for reasons already stated above. The price for this system without a box is actually more than most of the rest and will typically run you at least $60-$90. The dog bone controllers also fetch a slightly higher price because they are a little more rare. 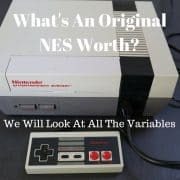 There is a lot to take into consideration as you can see when trying to price or figure out a price for any version NES. Please, please, please, take into consideration the condition and completeness and you can always refer back to this blog as a reference or reach out and email me for any further questions. I am a long time Nintendo collector and have numerous sources for detailed information on any kind of question around Nintendo gear, games and collectables. I challenge you to try and stump me or my close friends, I really don’t think it will ever happen. I also want to thank Kennith and Deniz at Wata Games for helping me make sure my list of NES console releases was complete. There are a few variants that are not listed, but I really didn’t feel those are necessary to list as there are very small variations that only a very detailed collector would care about. The list is long enough as is and the price difference on those systems isn’t enough to warrant listing them. Thank you for reading this far if you have as this blog has been a labor of love. Please be sure to leave any thoughts and comments below. I would also love to see any and all pictures of peoples collections and maybe if I get enough will create another blog to show some of them off! https://www.mcmrose.com/wp-content/uploads/2018/07/what-is-an-original-nes-worth-today.jpg 1078 1655 mcmrose https://www.mcmrose.com/wp-content/uploads/2018/06/mcmrose-logo-3.png mcmrose2018-07-26 07:07:342018-09-15 19:14:45How Much Is An Original Nintendo Worth? What do u think is worth for? I can send you a pictures but… I don’t know how… if I get your email..
Hi Payam, I think we talked on FB already but if not you can email me at matt@mcmrose.com. Condition is everything in regards to pricing. I know we talked and thank you for sharing your story and what you had. Feel free to stop in any time or message me with any other questions! Saw this and didn’t want to feel left out. I own a new never been opened original nes.The bare bones one and was wondering if anyone is up to take it off my hands? You can email me at Matt@mcmrose.com and shoot me some pictures so I can get a better idea and maybe make you an offer.